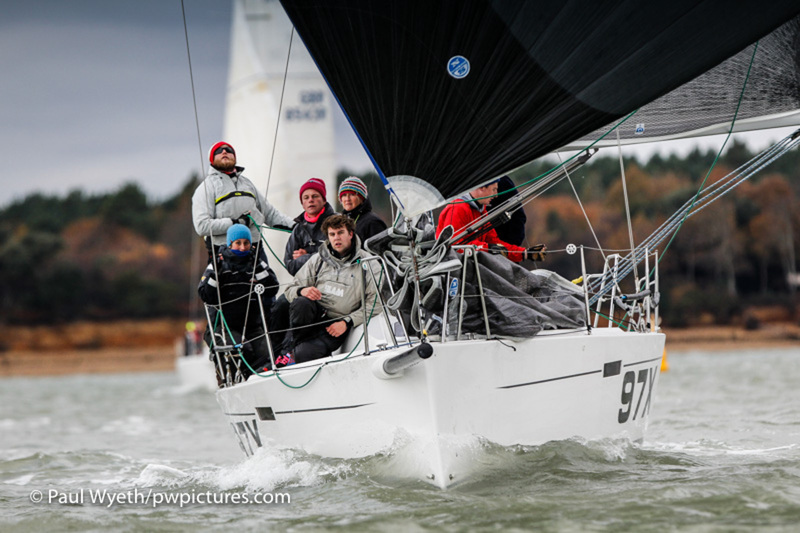 Despite awaking to biblical rain and the best efforts of Storm Angus, the braver souls in the Hamble Winter Series fleet were rewarded with some champagne sailing. 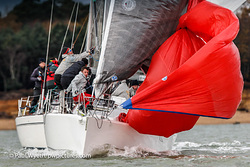 The race team were quietly confident that the high winds seen the night before would moderate in time, and true to form the wind had dropped to a west to northwesterly 10 knots by the end of the day's racing – leading much of the fleet to do hurried headsail changes before the final beat. 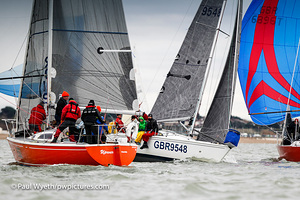 It was a cold day on the Solent, though – and kudos to the race volunteers who braved the chill in RIBS and committee boats to run some great racing.And the racing was certainly close. In IRC4, Impalas Imptish and Polly crossed the finishing line at exactly the same moment after eight miles of racing. With one race left to sail, Roger Bowden's King 40, Nifty has neatly sewn up IRC1, finishing first to add another bullet to her scoreline. 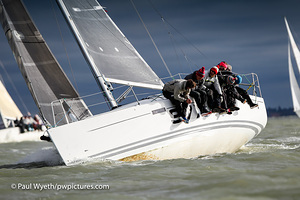 James Wilkie's Reflex 38 Fast Tack Puma was second, with Thomas Kneen's JPK10.80 Sunrise third. 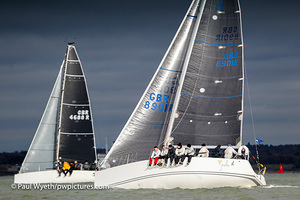 In IRC 2, Mike Bridges' Elan 37 Elaine also cemented her position atop the class, finishing nine seconds ahead of Simon Perry's J/109 Jiraffe, the crew of which were celebrating the owner's birthday. Elaine leads Jiraffe by four points with a race to spare. 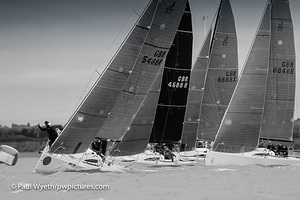 Third was winter series stalwarts Robbie and Lis Robinson on their First 35 Hot Rats. 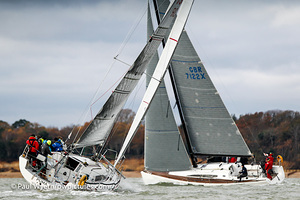 Chris and Vanessa Choules' With Alacrity won the IRC 3 class, finishing ahead of fellow Sigma 38 Mefisto to claim their day prize. Third and three seconds behind was Jamie Muir's SJ320 Scarlet Jester. With one race left to sail, it is Robin Stevenson's J/92S Upstart that leads the class by 2.5 points. Giovanni Belgrano's Whooper added to her impressive scoreline with another win in IRC4, followed by Stuart Danby's Mustang Respect and Jeffery Dakin's Flashheart. 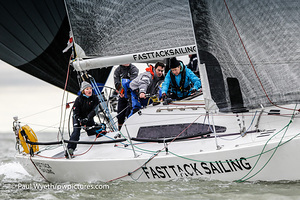 While Whooper is well clear at the top of the class, Respect and Flashheart are tied on points going into the final race – which could lead to some match racing next weekend. 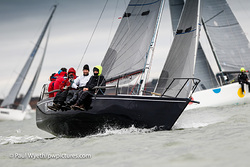 In the J/88 class it was Kirsty and David Apthorp and crew on J-Dream that won Sunday's race, finishing comfortably ahead of Gavin Howe's Tigris and Richard Cooper's Jongleur. That leaves J-Dream six points clear of second overall, Paul Ward's Eat Sleep J Repeat, themselves one point clear of Tigris. Crews couldn't believe their luck and swapped tall tales of floods and gales once back ashore for the prizegiving at HRSC, supported this week by the J/88 class, which supplied bottles of champagne to day prize winners. 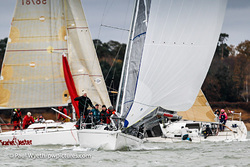 Special prizes this week went to Mefisto and Jongleur for the best starts of the day and to With Alacrity for the best corrected time over distance sailed in Sunday's race. Next week sees the final race of the series – and the forecast looks good. See you out there!